These coach bolts are zinc plated, and ideal for timber to timber joining. They come complete with with a hex nut and are fully threaded to 100mm. Coach bolts upto 100mm are fully threaded, over 100mm will have a minimum of 100mm of thread unless stated. Also known as 'cup square hex bolts', the square underneath the cup stops rotation of the bolt when tightening. Conforms to DIN603 and DIN934 standards. Available in a comprehensive range of sizes to suit most applications. Used mainly for fastening timber to timber and is extensively used for timber joist construction in house building and numerous decking applications. A carriage bolt, also known as coach bolt or as cup square hex bolts, has a domed head, and the shank is topped by a short square section under the head. The square section grips into the part being fixed (typically wood), preventing the bolt from turning when the nut is tightened. 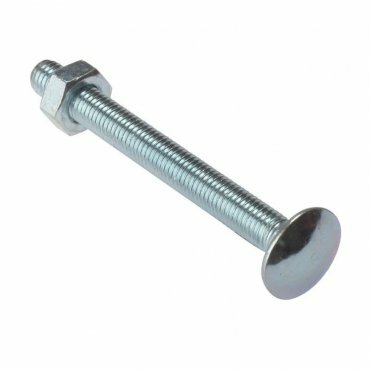 A rib neck carriage bolt has several longitudinal ribs instead of the square section, to grip into a metal part being fixed.